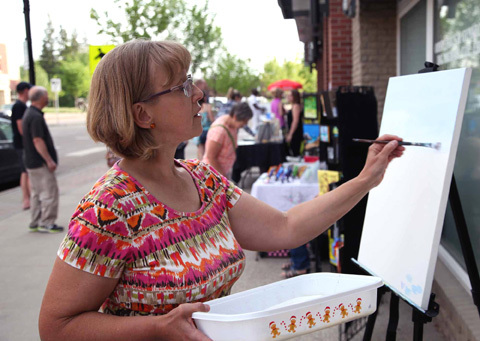 The very beginning of my garden painting at the June 2018 St. Albert ArtWalk event on Perron Street in St. Albert. Photo Thanks to Memory Roth Photography. Always fun, free, family friendly events, this year there are many locations hosting local artistic talents including St. Albert Place and the Hemingway Center. There is often live music, free popcorn and many down town business are open during these events. I, and some of my friends, will be painting and showing our works on the side walk in various locations in downtown St. Albert. Drop by and say Hello, see what’s new, let me know what you’ve been up to. Hope to see you there this spring/summer! This is a rain or shine event with many indoor venues. Very new this year is the recently renovated Art Gallery of St. Albert. It is worth checking out!